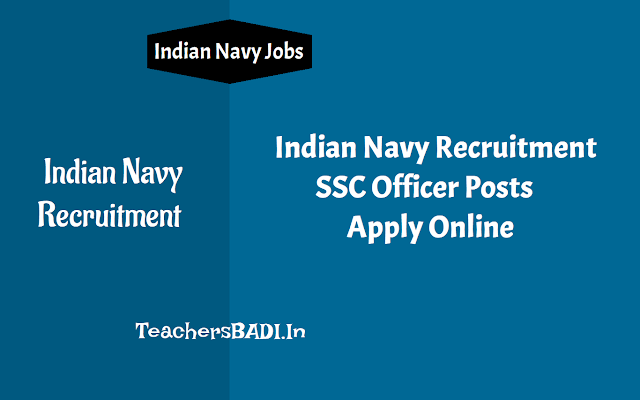 Indian Navy Recruitment 2018: Apply online till October 5 on joinindiannavy.gov.in : Indian Navy has invited applications from unmarried male/female candidates for grant of Short Service Commission, SSC in Executive Branch (logistics and Law cadre) and from unmarried male candidates for grant of Short Service Commission, SSC in Information Technology Specialisation in the Indian Navy. Online applications are already open on joinindiannavy.gov.in Interested candidates may apply till October 5, 2018. Check eligibility criteria, selection process and steps to apply below. Indian Navy invites applications from Unmarried male/ female candidates for grant of Short Service Commission(SSC) in Executive Branch(Logistics and Law Cadre) and from unmarried male candidates for grant of Short Service Commission(SSC) in Information Technology Specialisation for Jul 2019 course conducted at Indian Naval Academy, Ezhimala. B.E./ B.Tech., B.Arch, BCA, B.Sc./ B.Com./ B.Sc., M.Sc./ M.Sc. (IT), MCA(relevant discipline), Degree in Law with Medical standards. For ,SSC Logistics branch, candidate must own a degree in either of these courses B.E/ B. Tech, MBA, B.SC/ B.Com/B.Sc. (IT), MCA, B. Architecture with minimum of 60 percentage of marks. For SSC in IT branch, candidates need to posses qualification in either of these BE/B.Tech/ Computer Engineering, M.Sc, B.Sc, M.Tech, BCA/MCA with 60 percentage of marks. For SSC in Law, candidate must own a degree in Law with 55 percentage of marks. Candidates should note that permanent body tattoos are not permitted on any part of the body. Based on Intelligence Test, Picture Perception and Discussion test, Psychological testing, Group testing, Interview and Medical Examination. Candidates would undergo medical checkup and an interview round. Interviews would be conducted during November 18 to March 19, 2019. SSB interviews would be scheduled at Bangalore, Bhopal, Coimbatore, Vishakhapatnam and Kolkata.Only unmarried candidates are eligible to undergo training after ebing selected. They will be on probation period of two years. Step 1: Candidates need to register themselves on the link provided here. Step 2: Candidates need to provide, e-mail address, mobile number, scanned copy of class 10 and 12 mark sheet, birth proof and recent passport size photograph. Step 3: After duly filling in the relevant information, candidates may take a print out of the application form. It is to be noted that the application form and original documents should be carried by the candidates for interview round.